When Girl Scout Juniors (grades 4–5) take part in the Girl Scout Cookie Program, they’re helping lead the largest entrepreneurial program for girls in the world. How? By learning essential life skills, setting (and crushing!) impressive goals, and using their cookie earnings to go on epic adventures and make the world a better place—wow! Many of these incredible skills start with a Girl Scout badge, and we’re exploring all of them! Meet the Junior badges Girl Scouts can earn during cookie season. After earning the Business Owner badge, Juniors will know the basic steps to plan and create a new business and how to turn their passions into a successful business venture. Once girls decide which type of business they’d like to run, they’ll explore the ins and outs by talking with local business owners to spark ideas and get answers to questions. A new business needs support to get off the ground! So, girls will learn all the ways a new business is financially supported, whether through bank loans or government assistance. Last, to get to know their customers, girls will dive into customer research to see how their new business will reach their community and provide it with a service it needs. Earn the Business Owner badge. When Juniors earn the Savvy Shopper badge, they’ll know the difference between what they need and want to buy—and how to save for both. In a world of advertisers, social media influencers, and fast-moving trends, it can be hard to determine if that item on display is what you really want to spend your money on or if there is something better to invest in. Through this badge, Juniors will evaluate these important decisions and learn how to make smart spending choices that will benefit them for years to come. Earn the Savvy Shopper badge. 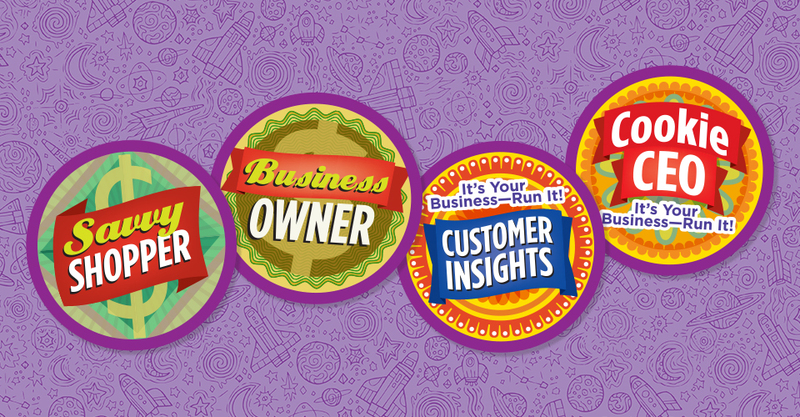 Through the Cookie CEO badge, Juniors will know how to run all aspects of their cookie business—because they’re cookie bosses, of course! Through this badge, girls are challenged to break their cookie goal into smaller ones (like weekly sales goals) to make sure their troop is on the right track to reach the ultimate goal (like a summer at Girl Scout camp, perhaps?). The troop will work together by dividing up tasks among girls based on their individual skills. They will then put those skills into action when communicating with their customers, making a good impression and building community relationships at the same time. Earn the Cookie CEO badge. It’s key to get to know your customers, and through the Customer Insights badge, Juniors will have a better understanding what their cookie customers want, making business even stronger! First, girls will seek out the experts—maybe a local businesswoman who just happens to be a Girl Scout alum? Girls can ask her questions and get some pro tips. Then they’ll dig into research to figure out how to market their Girl Scout Cookies. Girls will create their own surveys and ask customers questions. And if customers still say, “no thanks” to Girl Scout Cookies? No worries! This badge will help girls turn a “no” into a useful business lesson so they improve and gain more confidence. Earn the Customer Insights badge. Has your Junior earned one of these awesome badges, but you don’t know where to place it on her vest or sash? Our new visual guide to Girl Scout Junior uniforms can help!